A good bike path is predictable and unexpected. A good bike path is popular and inconspicuous. A good bike path is simple and adventuresome. Despite the minimalist nature of this quadrant cutting bikeway, there seem to be endless opportunities. Consequently, in Southeast, in all its natural and man made beauty, I have found a favorite bike path in Portland. Beginning from its most western point, the path starts at the food carts at Hawthorne and 12th, known as Cartopia. Most folks would confess that it’s not good to start your bike ride with a big meal. But I am a character of contradictions. After stuffing face with Potato Champion fries or a Bottle Rocket burger, look to the south to embark into Ladd’s Addition. 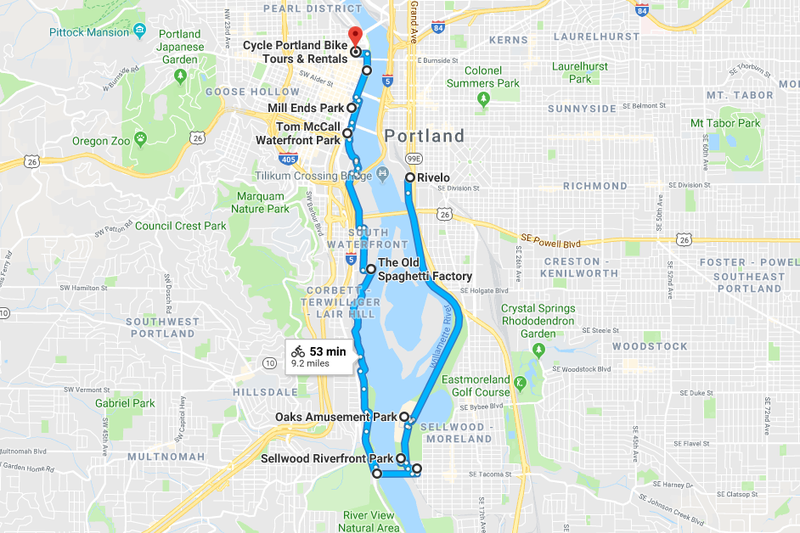 Inspired by the French L’Enfant design, this section of Portland sticks out on a map like a positive drug test result at the Tour de France in the early 2000s. There is plenty of room for cyclists to pedal while enjoying the local scenery in this cozy neighborhood. Find comfort in the shade of the American Elms. Gander at the diverse homes. Inhale the fresh Portland air. Then exhale and round Ladd’s Circle. Next, veer off right to exit onto Harrison. Circumvent the small neighborhood Rose Garden. Past this, heading east, there will be a stoplight. Perpendicular to your path is 20th Avenue, a popular road for cars to use. Consequently, this stoplight is a nifty piece of Portland bicycle infrastructure. Often, busy intersections are where car-bike and car-pedestrian related accidents occur. The light here ensures that all travelers are aware of the frequent use of this cross-section. Following the white crosswalk or green cross-bike, citizens can cross comfortably as cars come to a halt indicated by the blinking light and stop sign. It’s nice knowing a city wants to protect its citizens. Additionally, there is no through traffic by car at this cross. In fact, there is even a barrier that allows only cyclists to cross 20th. This is part of a measure to prevent cars from traveling for extended periods of time on the Neighborhood Greenways of Portland. This development is a staple of Portland’s commuter transit. 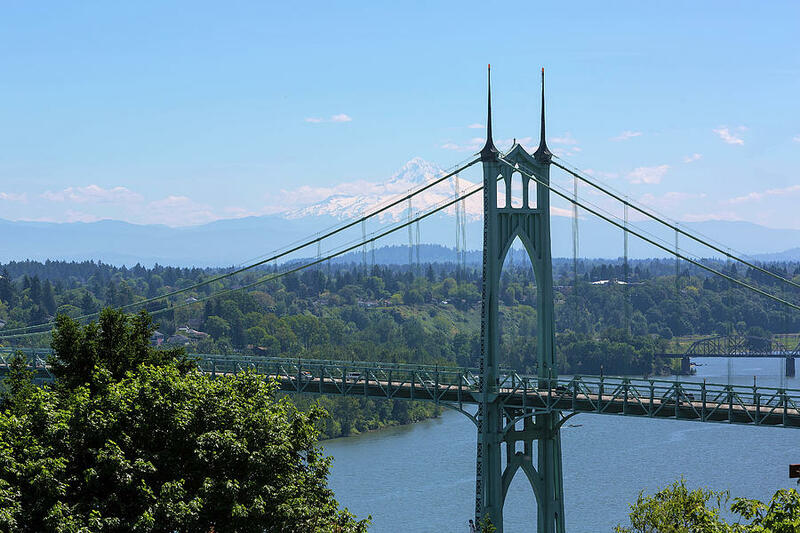 It is part of what separates Portland as one of the best biking cities in America. Alas, begin a gradual ascent up Harrison. A single speed nightmare, a commuters struggle, a cyclists bunny slope, this ten block hill offers scenic homes and foliage to enjoy until reaching another bike friendly intersection with yet another 4-way with flashing red lights. When free to cross safely, the ascent is rewarded with a rightward verge onto Lincoln that carries cyclists downhill. 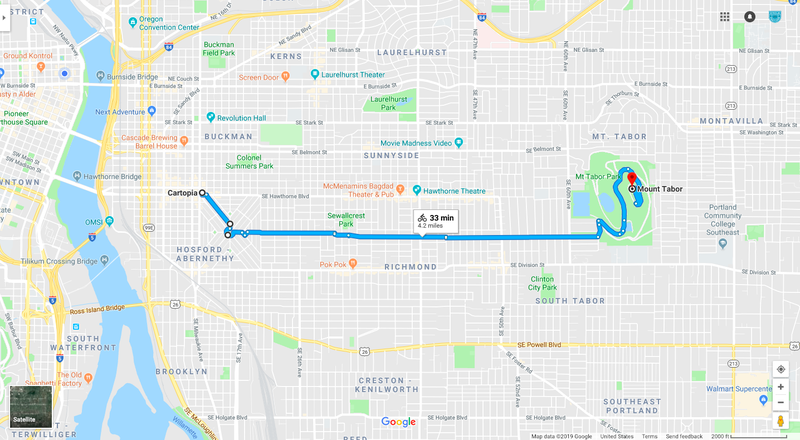 Following Lincoln through the heart of Southeast Portland, bikers may peel North or South to enjoy the sights and sounds of our popular districts. Diverting North, Hawthorne Street exemplifies the weird and fun quirks that make Portland so… well… Portland. Shop at boutiques and thrift stores, enjoy fine dining and food carts, and explore Portland culture. Alternatively, turn South and check out Division Street, a newly flourishing part of Portland offering some of the best food and neighborly feels. Occasionally, if I opt to skip Cartopia beforehand, I’ll stop at my favorite brunch spot Trinket for the ambiance and neighborhood vibes. 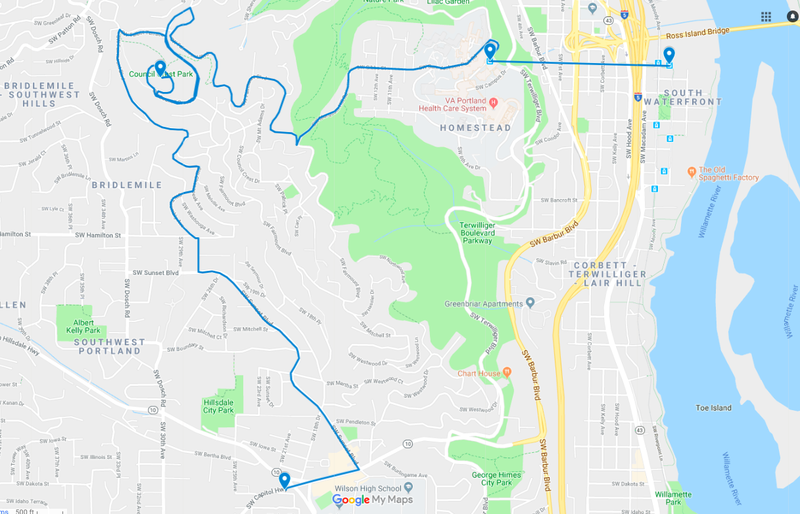 Ultimately, orient back to Lincoln, continue along the Greenway passing puppies, pedestrians and parks while following signs to Mount Tabor. After crossing another well maintained and safe intersection at Lincoln and 60th, the Mountain will be to the left. Tabor’s main road to the summit offers stunning views to the East. 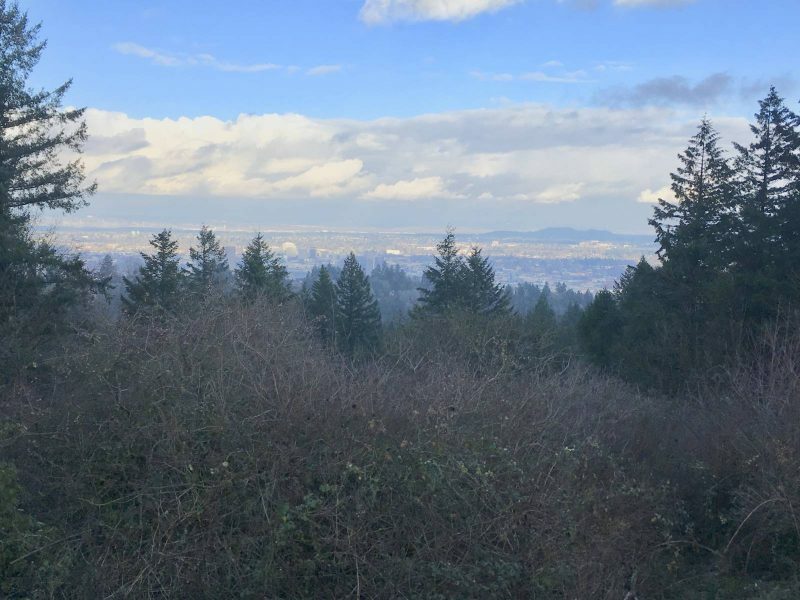 Making way up the volcanic cinder cone, Portlanders can get their fix of mountains, trees and greenery within city limits. Finally, the summit. Take in the city of Portland, enjoy a snack and watch the sun set behind the city with others. Share in the beauty of Portland. Share in the beauty of bicycle infrastructure. Share with me my favorite bike path in Portland. “Portland doesn’t turn its back on the less fortunate” claims Cycle Portland staff member Jesse Levy. 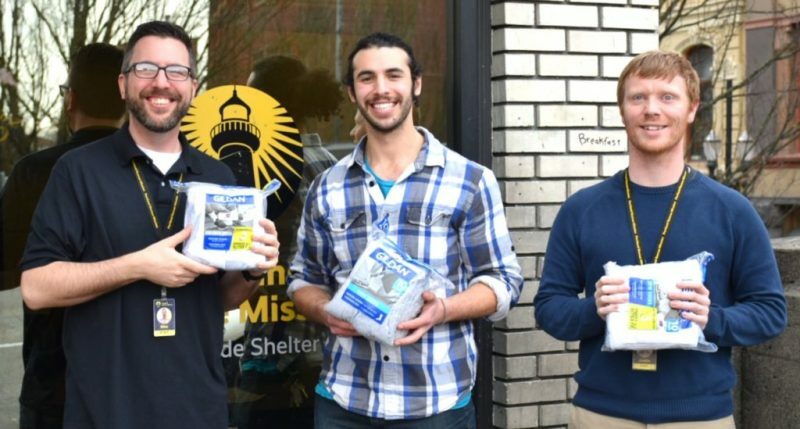 During the month of December, Sock Hop, Cycle Portland’s sister company, donated a portion of their sales toward purchasing socks for the homeless of Portland, Oregon. While the weather gets colder, our hearts (and feet) warm at the notion of helping the homeless with a sock donation. Join the cause! Leaders in Portland’s emergency service operations, the Portland Rescue Mission provides clothes, shelter and resources for Portland’s homeless population. The PDX Rescue Mission is a close neighbor of ours. Customers purchase more socks from us for the holiday season. We decided to do a little giving of our own. Through December, Sock Hop and Cycle Portland contributed a successful sock donation. Over 60 socks and assorted clothes were given to the Rescue Mission and homeless of the city. Furthermore, Cycle Portland is looking to continue to build our relationship with the community. As a result, assisting the homeless became a priority in our cause. “We’ve been involved with the community association for several years,” describes owner Evan Ross, “and wanted to continue to work on livability issues in the neighborhood.” In Downtown Chinatown, people have jackets, pants and often times even access to food. What they don’t have… are socks. Portland doesn’t turn it’s back on those in need, and neither should you. Cycle Portland, Sock Hop and the Portland Rescue Mission encourage those fortunate enough to buy their own socks to contribute to the homeless community. There is a list of needed goods included on the Rescue Mission website. Finally, join us in building a better community, comfortable living situation and prosperous future. 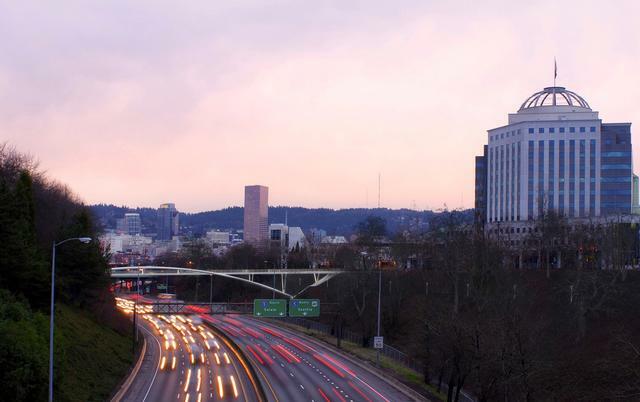 Portland City Council’s recent unanimous vote to pass the Central City in Motion Plan has got us excited about the proposed projects soon to be under way. The plan will create a better Downtown and Central Eastside for non-car commuters. It will benefit students in the area. It will provide Bridgetown with a new Portland Bridge. Cyclists in Portland have often warned one another to “Avoid the Lloyd.” Translation: The Lloyd District ain’t for pedal people. It isn’t just hyperbole. With its weird intersections (like the crossing of NE Lloyd Blvd, 13th and… 16th. wtf? ), rat’s nest of a railroad crossing through a bike lane on 11th, and multi-block street interruptions (I’m looking at you Lloyd Center) the Lloyd District is best sidestepped. Recently, improvements have been made to improve the laborious Lloyd. A marked path over the MAX rail on 11th helps and NE Multnomah Street’s (partially) protected bike lane makes for a nice East/West passage. But the main problem remains: Safely crossing Interstate 84. While heading south on 7th (the districts only north/south bike lane thoroughfare) you are presented with two options at the T-junction with Lloyd Blvd. First, you could, A) Turn right. Next, head down the hill in the narrow bike lane. Whilst traveling, avoid the lumber piles of sticks that fall there. Then, cross Grand Ave. Simply merge across two lanes in 100 feet to make a left with the cars and trucks onto MLK Blvd. Finally, pedal like your life depends on it (because it does) along the 4 lanes of cars trying to either get to the 84 on-ramp or beat the light at Burnside. Alternatively, you could B) Turn left. Then cross, from a stop, the 4 lanes of traffic to the bike lane on the far side. Next, merge in front of car traffic at 11th to turn right on 12th. If you’re lucky, you won’t get cars racing around you to pass you in the same lane that you’re riding in until you reach the bike lane after Irving. After that, all you have to worry about is the triple trailer, 26 wheeler trucks pulling out of Franz Bakery. The 12th street crossing is the much better choice, but still far from ideal. Soon, however, we will have a third option: Sullivan’s Crossing Bridge. Named after Sullivan’s Gulch (the narrow valley which the I-84 and Union Pacific Railroad now occupy) the Sullivan’s Crossing Pedestrian/Bicycle Bridge will connect NE 7th on either side of the gap. At this new Portland bridge, a traffic light will replace the one-way stop on the Lloyd side. This new bridge will have 12 feet of pedestrian walkway and 12 feet of bike lanes. Including an awesome view of Big Pink, expect the pedestrian side to be a crowded spot for instagram shots. In addition to the bridge, 7th street south of the bridge will also be getting a makeover with wider sidewalks. Sharrows on what is already a relatively quiet stretch lead to improved bike lanes in South East. 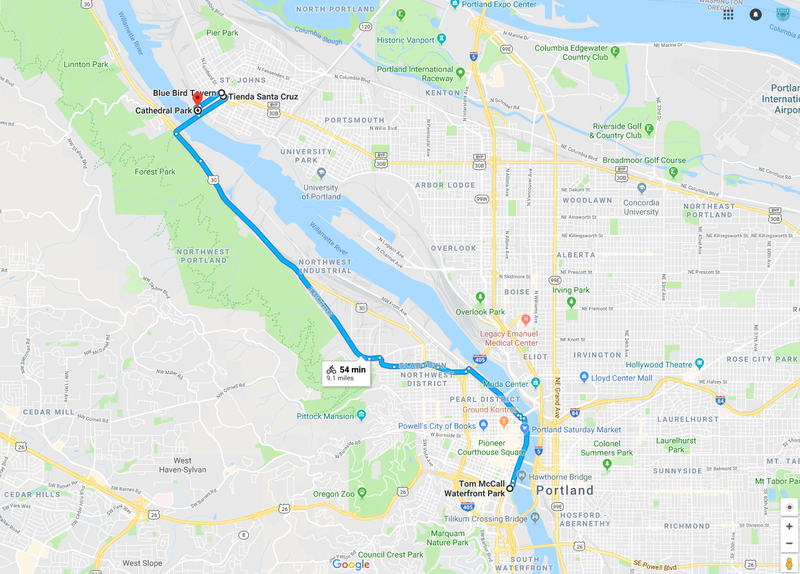 The project, scheduled to be completed in 2021, will be a major stepping stone in Portland’s proposed “Green Loop” of bike, jogging and walking paths encircling six square miles of Downtown and Central Eastside. Alas, Sullivans Gulch is the most awaited project according to surveys. When asked about prioritization, Portlanders claimed that of the 18 projects in Central City in Motion’s proposal, Sullivan’s Crossing was the clear favorite. Considering how many people will benefit: Students at Benson Polytechnic High School, MAX riders who work in the Kerns District, and Jimmy Johns delivery cyclists just to name a few, this isn’t very surprising. What is, is that it has taken this long to implement the concept of this new Portland bridge! Day after day, visitors of Portland come in to the shop and ask if its safe to ride a bicycle in this city. Take a step back and think about this… You pose this question to a tour guide in a bicycle shop in the heart of the bike capitol of the USA where my job is to rent a bicycle to you. What do you think my answer will be? So, after I tell them, “Of course it’s safe!” I explain why. Portland, Oregon is one of the most bike friendly cities in the United States and that’s in large part due to our bicycle infrastructure. As the bike paths and culture have developed, strategies are implemented for making travel easier for motor-less pedestrians. Before long I open up the city map and delve into the purpose of the Neighborhood Greenway. 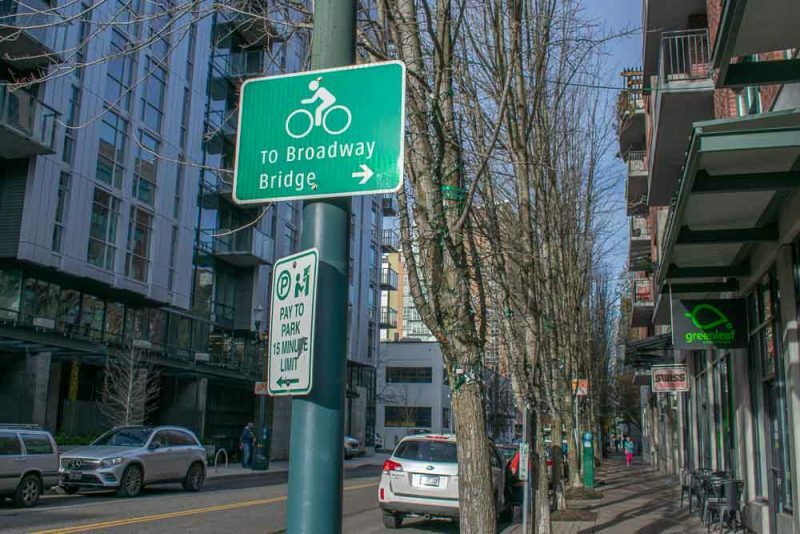 According to the Portland Bureau of Transportation (PBOT), “Neighborhood Greenways are residential streets with low volumes of auto traffic and low speeds where bicycles and pedestrians are given priority.” Essentially, these streets are placed to allow pedestrians a travel option. This system of paths comes with less interruption and frustration. 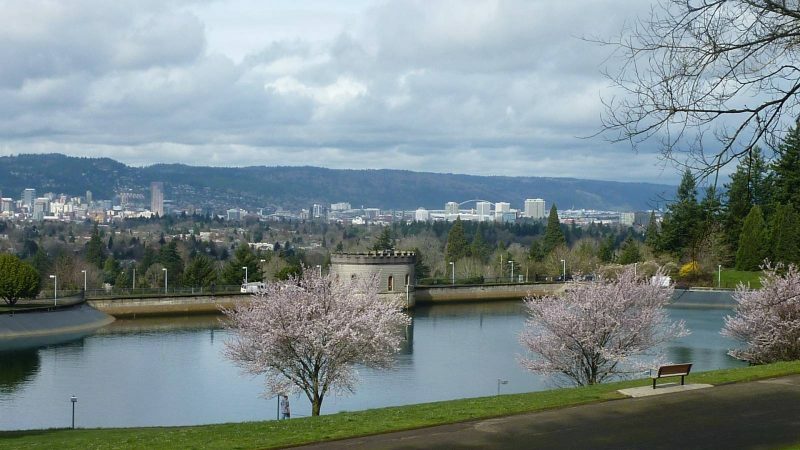 Portland has bright and knowledgeable city planners consistently developing infrastructure. 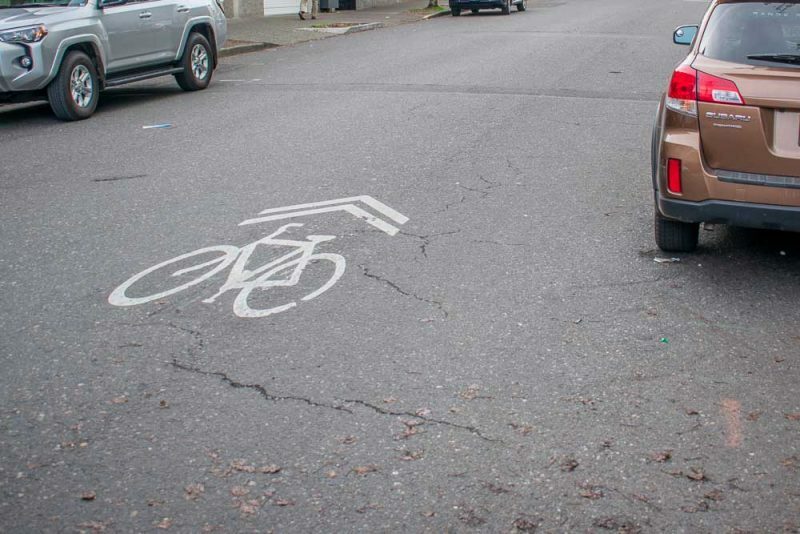 With careful thought and creativity, Portland regularly improves its bikeways! But how does the Neighborhood Greenway work? Throughout the city there are multiple signs (usually green) indicating the path of the Neighborhood Greenway and where it will take its followers. Roads are also highlighted by the white painted bicycles with arrows. Despite popular belief (and personal dream) that these are dash panels offering a speed boost, this is not its true purpose. Consequently, these street designs are used for directing traffic and reminding cars that they are traveling on a shared road. Hence the name “sharrows”. However, if you close your eyes and shout “WAHOO!” or any of these sounds I’m pretty sure you get a little power up from the Mario Kart gods. Divine Nintendovention. Firstly, the Neighborhood Greenway contributes to the flow of traffic and promoting transportation culture. Initially, these streets once served as ordinary automobile passageways. Subsequently, they were re-designed for multi-modal transportation. As a cyclist it can be incredibly frustrating to have to hit the breaks every other block. Luckily, cyclists and pedestrians are able to travel more freely by reducing the amount of stop signs traveling across the Neighborhood Greenway. But wouldn’t that encourage cars to use these paths more often? A lack in stop signs sounds like a shortcutting drivers paradise. Speeding past bikers and steering clear of rush hour traffic must be an obvious solution to any Portland car commuter. The city has taken steps to avoid this recklessness and preserve the road for cyclists. In fact, streets contain multiple speed bumps to slow cars and traffic diverts that allow space for cyclists to pass but are too large for cars. These techniques keep the amount of cars traveling on them to a minimum. Additionally, the speed maximum is much lower on these streets! As the Neighborhood Greenway mostly travels through, well, neighborhoods, cars commonly travel on the higher speed roads. 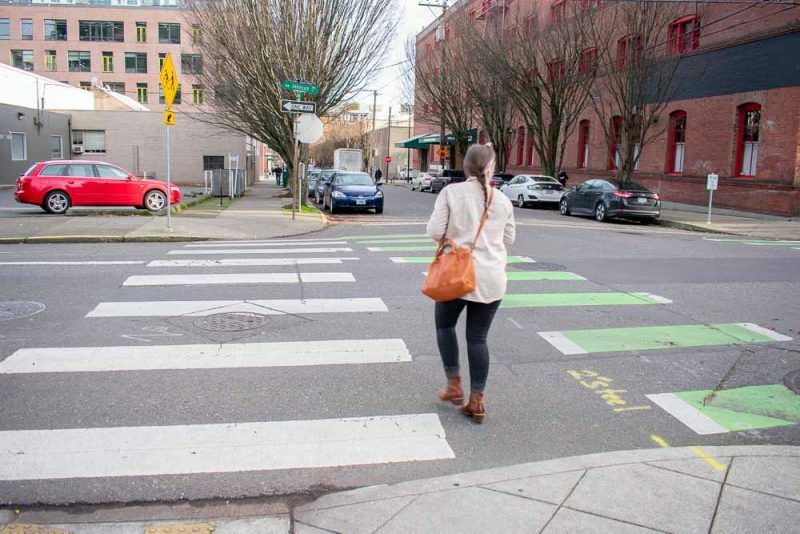 Reduced speeds keep Portland neighborhoods safer. Families, joggers, and other outdoor enthusiasts rely on the safe speed limit. Plus, many greenways are located next to or near popular driving streets and districts that are frequented for their busy storefronts. Bikes have a free space to ride near goings-ons while presenting cars with a more mobile form of transit. Everyone is safer and faster! Next we arrive at those tough intersection. Frequently, cars will speed down busy streets, ignoring pedestrians and cyclists looking to cross the intersection. Not cool cars. On the Neighborhood Greenway, intersections are highlighted with bright colors, signage and sometimes even cross signals. Comfortable crossing is crucial. On the busiest streets at the busiest times of day, Greenways provide safe passage. Additionally, at multiple intersections there are also signs that help direct traffic by letting folks know what is nearby. By chance, I have visited multiple parks throughout the city due to Neighborhood Greenway signs. Portland ensures cyclist know where they are going. 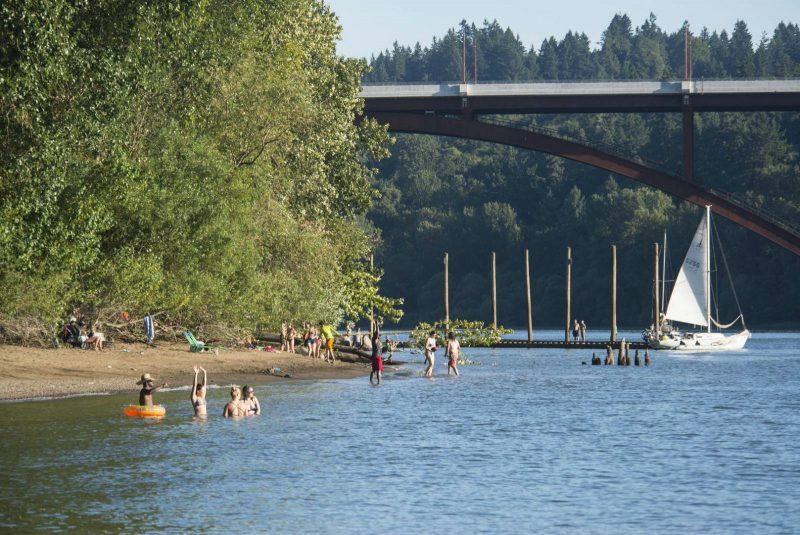 Above all, Portland considers itself “the city that works”. Yes. Between the Neighborhood Greenway, car free paths and divided bike lanes, there is almost always a safe space for cyclists to travel. Given that you are riding cautiously and respect the rules of the road, it is safe. Be courteous, be friendly, be aware. Then bike travel will be your best friend.